Taking care of our furry family members is important. Therefore, feeding them right is just one way to make sure they stay happy and healthy for a long time. Some pet owner’s aren’t familiar with the food / health correlation. Their pets may not be doing well and they don’t understand why. There are some simple steps pup-owners can take to change their dog’s diet to help with their overall health. My Dog and People Food? First, its ok to feed your pooch people food. This doesn’t mean pizza and chips. It does mean incorporating veggies into your pup’s diet. 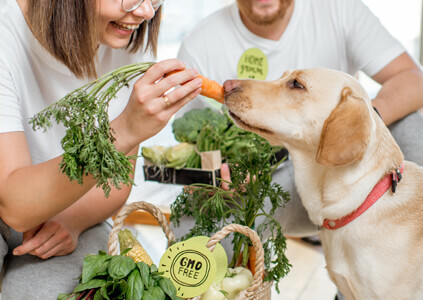 Some healthy food for dogs include vegetables which provide natural minerals and vitamins and can help with digestion and make sure your pooch feels full without a lot of empty calories. Some of the favorites include baby carrots, green beans, and leafy vegetables like cabbage or kale. Each of these healthy snacks provides nutrition and will be a fun change for your pooch. You should not feed Fido onions, shallots, or scallions because they can cause anemia and be careful with avocados – the pit can cause intestinal obstructions and should be avoided. Another change you might want to make to your dog’s diet is adding foods that will help with arthritis and joint pain. As our pups get older, they may have trouble moving around as easily as when they were young. You can add blueberries for their anti-oxidant properties and sweet potatoes in moderation will also help your pup’s joints. Healthy food for dogs is often as easy as raiding your own pantry and refrigerator to find snacks your pooch will love. The third change you make when feeding your pups is making sure they get enough omega fatty acids. If your pups have dry skin or a dull coat, this might be caused by not enough oil in your dog’s diet. Some commercial dog food will have oils added or you can include some coconut, salmon, or flaxseed oil to your pup’s food. Our dogs provide unconditional love and as pup parents, we want to make sure they are eating healthy food for dogs, so they will live a long time. Making just a few changes and adding some fruits, vegetables, and oils will keep Fido and Fifi feeling great and energetic. Do you have questions about what to feed your dog, or questions in general? Contact us and let us know how we can help.